Virginia’s next icon: A state salamander? Virginia could get a state salamander thanks to a push from students, under a bill set for a vote in the House of Delegates Monday. WASHINGTON — Virginia could get a state salamander, thanks to a push from students, under a bill set for a vote in the House of Delegates Monday. 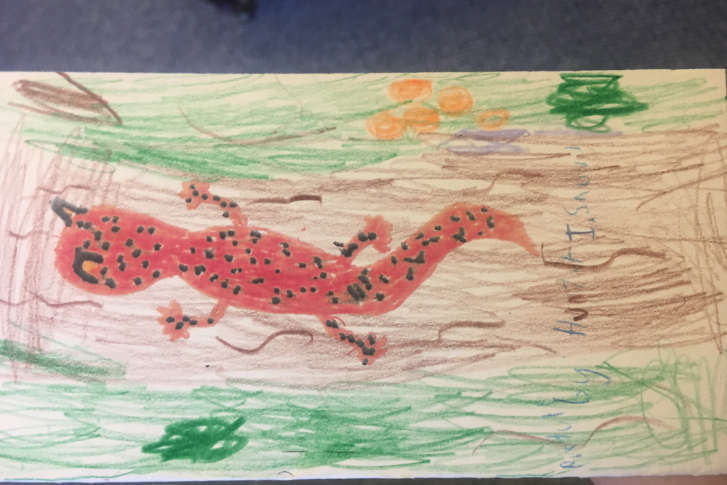 A group of students from Northern Virginia and the Williamsburg area asked for the bill and lobbied for it — including by drawing cards supporting the red salamander that they delivered to lawmakers. “I was really impressed with them, they started and founded this organization known as the Salamander Savers. It’s a 4-H group, and they did their research, wanted to be involved in the process and see this through,” Del. Eileen Filler-Corn said. A 4-H group is a network of organizations that gives kids opportunities to learn through hands-on projects in health, science and citizenship, according to the 4-H website. Filler-Corn’s bill, introduced at their request, is due for a final vote in the House of Delegates Monday, which would send the bill to the state Senate. The red salamander’s scientific name is the pseudotriton ruber. It is native to Virginia. Other state symbols already in Virginia law include the official state beverage (milk), bat (Virginia big-eared bat), bird (northern cardinal), type of boat (Chesapeake Bay deadrise fishing boat), dog (American foxhound), freshwater fish (brook trout), saltwater fish (striped bass), flower (American dogwood), folk dance (square dancing), insect (tiger swallowtail butterfly), rock (nelsonite), shell (oyster shell), snake (eastern garter snake), spirit (George Washington’s rye whiskey), tree (American dogwood), fossil (an extinct scallop named after Thomas Jefferson Chesapecten jeffersonius) and three separate songs. “Carry Me Back to Old Virginny,” a song that includes racist language, was selected as the state song in 1940, but was redesignated as the commonwealth’s “song emeritus” in 1997. A separate bill to add “The New Dominion” as the state poem was deferred Thursday until 2019.